The Vendor History Report can be used to find information on paid vendor invoices if they were paid since the cut‑off date of the last purge of the A/P Open Item File. This report is printed from the A/P Open Item File and, therefore, will not show any paid invoices, which have already been purged from the file. However, individual Vendor History can be controlled by the A/P Purge functions. If you are looking for information on an invoice which was paid on or before the cut‑off date of the last purge, you will have to look through the purge journals of your previous purges, but if you are trying to find an invoice which was paid since this date, the Vendor History Report can be used. Enter the first vendor to appear on the report. This field will not be entered if All vendors are selected above. Enter the last vendor to appear on the report. This field defaults to the starting vendor number to make it easy to print a single vendor. Enter the starting date of the period for which you wish to print the report. Any invoices fully paid between this date and the ending date will appear on the report. This field defaults to the day after the last purge cut‑off date and cannot be set to an earlier date than this. 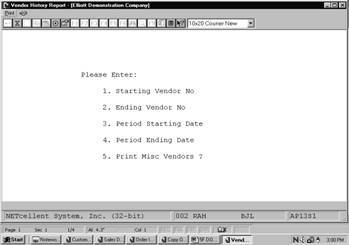 Enter the ending date of the period for which you wish to print the report. Any invoices fully paid between the period starting date and this date will appear on the report. This field defaults to the period starting date to facilitate printing the report for a single date. 5. Print Misc Vendors ? Enter Y to print miscellaneous vendor account or N to decline.